Beat butter with sweeteners until light and fluffy. Beat in egg and vanilla extract. Combine dry ingredients together. Add dry ingredients to butter/egg mixture and blend well. Line a baking sheet with parchment paper. Place about 1 measuring teaspoons worth of dough on baking sheet 2 inches apart. Press down lightly to make a small disk. Bake for 12-15 minutes until cookies begin to brown on the edges. 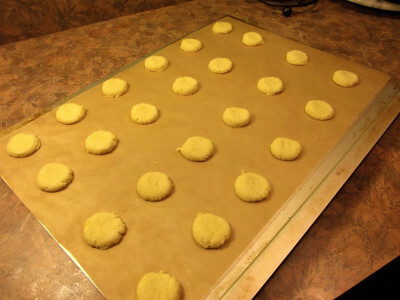 Pull cookie sheet from oven and let the cookies sit on the baking sheet until they cool. Cookies will firm up a little as they cool. Don't try to move them too soon or they may fall apart! Makes ~45 cookies. If you get less or more you may have to recalculate the nutrition info.